If you’re looking to escape the winter chills and head to the Caribbean with the family, motoryacht TURQUOISE has a warm offering waiting for you. How does a whopping 30% discount sound for your next luxury yacht charter vacation? A finalist for the World Superyacht Awards for best refit in 2014, Proteksan-Turquoise motor yacht TURQUOISE was elegantly styled by the award-winning team at H2 Design. Elegantly styled with the benefit of an experienced eye for luxury service, the superyacht is crammed with watersports toys and well-appointed with the latest entertainment systems. Make your next superyacht experience a true holiday of a lifetime. Come experience yacht TURQUOISE at the deepest discounts offered this year… Available in the Bahamas and further south as a Caribbean Yacht Charter Vessel (in St. Barts, Antigua, St. Marten, etc.). For more information or to book superyacht TURQUOISE for your warm and discounted vacation, visit https://www.1800yachtcharters.com/book-now-contact-us/ to access our convenient 24 hour online booking form. Turkey’s Proteksan Turquoise Yachts Inc and London-based H2 Yacht Design, the team that produced the popular Miami yacht charter vessel, yacht SEQUEL P, and the award-winning motor yacht VICKY, are joining forces once again. The new build currently named Turquoise Yachts Project Barracuda is expected to splash down in 2019. Interior spaces will again be designed by H2’s Ken Freivokh. Freivokh’s clean conception will include his signature triple-deck high atrium amidships that will be the source of much of the natural light that will flow throughout the superyacht’s interior. Charter guest accommodations will include a large master suite, two VIP staterooms and four additional guest cabins. Amenities will include a full beam sky lounge, beach club with spa features to accommodate wellness yacht charter clients, and an onboard cinema. The Turkish yard and London designers also collaborated on the 70 meter motor yacht TALISMAN C, and the 54 meter motor yacht TURQUOISE, both launched in 2011. 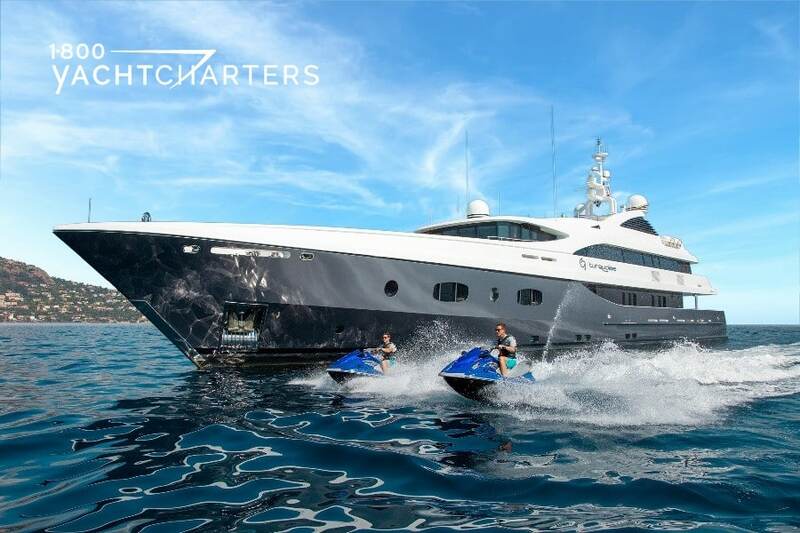 To charter a yacht like Project Barracuda in the Caribbean, the Mediterranean, the Bahamas, Southeast Asia, New England, or other ports of call, contact 1-800 Yacht Charters on our 24 hour hotline at 305-720-7245 or use our convenient booking form. 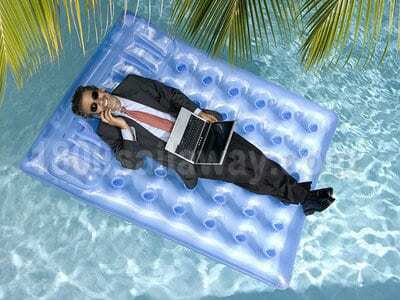 The working vacation: one report estimates that 30% of employees do office work while on vacation. Sure, you can call it an oxymoron, but in reality, many corporate executives mix business with pleasure when spending time away from the office. Increasingly, the largest yachts available for luxury mega yacht charter are being designed with the business traveler in mind – whether it’s via a small desk to check emails, or a complete media room for meetings and conferences. The most common design is an area adjacent to the master cabin, which can serve as both an office or a sitting room. The least common, but starting to appear in more and more superyachts is the dedicated meeting center. Normally not part of the master suite, these dedicated media spaces are often on a separate deck, with room for conducting business and holding meetings or small conferences. 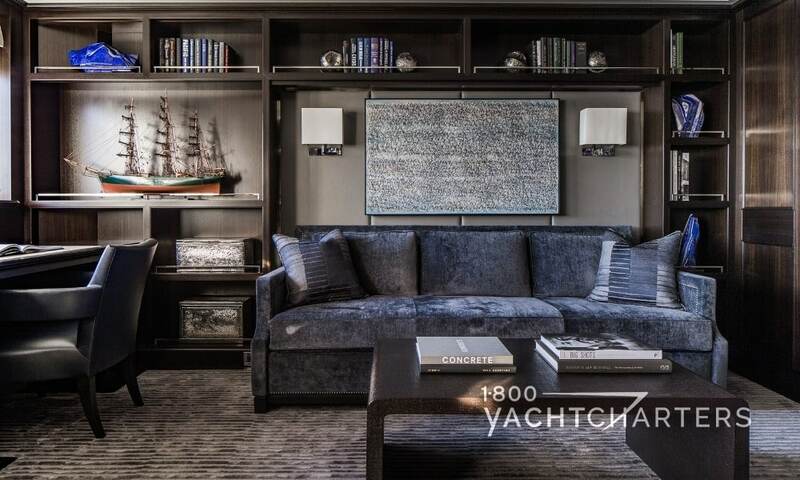 Whether formal or casual in design, most office spaces onboard yachts feature built-in internet connections, video screens, storage space, and most importantly – privacy. Motoryacht MI SUENO – the study is part of the owner’s suite and features comfort, privacy, and the latest in technology. Motoryacht SIREN – situated forward on the yacht’s main deck is the master suite. Attached is a private office which can be converted into a nanny’s stateroom with a double Pullman berth. 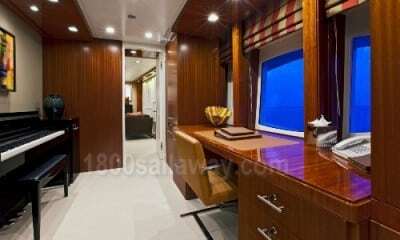 Motoryacht TURQUOISE – connected to the owner’s cabin, the office seems small in comparison to other yachts. What makes the room with desk so charming is the upright piano. Remember to always focus on wellness. Take a technology break on vacation. You owe it to yourself to rest, relax, and enjoy the fruits of your labors! Plan your next corporate retreat on a private yacht. Contact our executive meeting specialists HERE today. 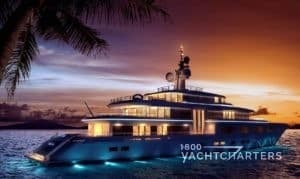 Attendees of the upcoming 2012 WORLD SUPERYACHT AWARDS, May 5, 2012, will enjoy an exclusive opportunity to visit the shipyards of two of the top builders of luxury yacht charter vessels. Builders Proteksan Turquoise, and Perini Navi are offering yacht owners, designers and VIP guests a guided tour of their shipyards in Istanbul, Turkey. 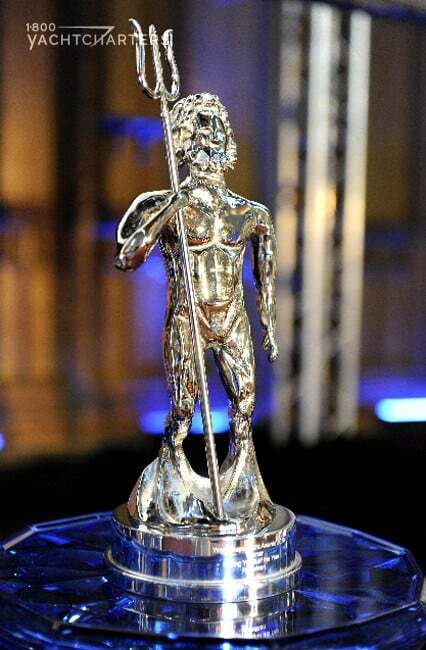 Of special note, 70.54m megayacht TALISMAN C, 50m ultraluxury sailing yacht FIDELIS, and 55.4m motor vessel TURQUOISE are 2012 World Superyacht Awards finalists. How do you change the color of your superyacht? Can you do it without spending a small fortune? Bring in the “wild boys” from Wild Group. Let them wrap your yacht in vinyl and foil. Wild Group is a vinyl yacht finishing company dedicated to the superyacht industry. They wrap the entire exterior in foil and vinyl for a fraction of the cost of repainting. Wrap alterings the look and color of the vessel. It is also a protective skin that reduces scratches and fouling from wear and tear at sea. Proteksan Turquoise motor yacht TURQUOISE is a vessel with a complete hull transformation done by Wild Group. 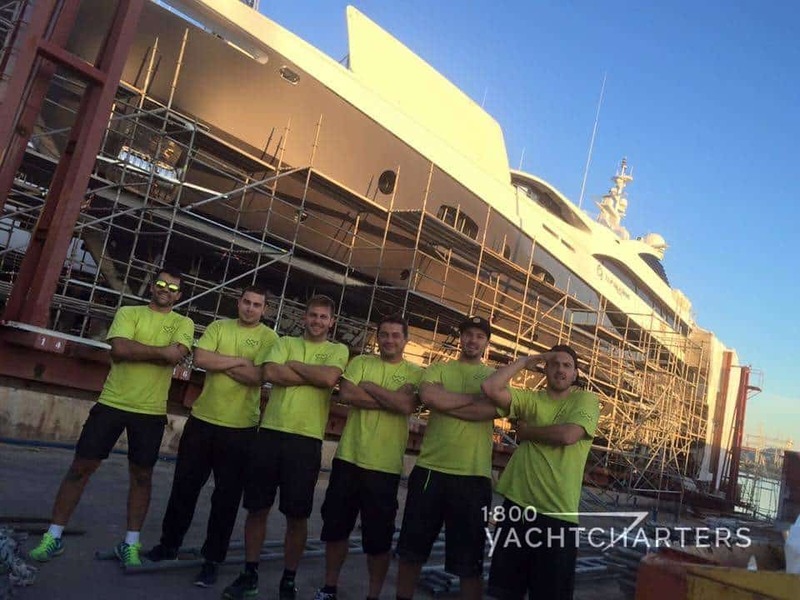 They completed a full hull wrap, and black wrap on house sides for the 55.40 meter yacht in Port Denia, near Alicante, Spain. 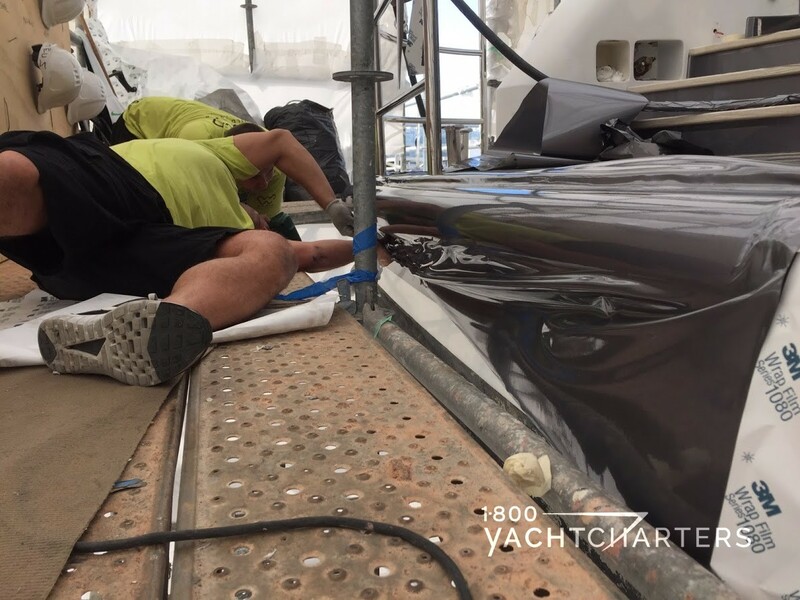 HOW LONG DOES IT TAKE TO WRAP A YACHT? The TURQUOISE project was finished in time for the yacht to reposition on schedule to the Caribbean. She was in place for the St Martin yacht charter winter season, December 2015 through April 2016. This was actually the second time Wild Group worked on the yacht. They originally wrapped the yacht superstructure overhangs in Matterhorn White. The paint had become dull due to constant exposure to the sun, so the wrap saved the day. The success of this super structure project led the yacht owner and captain to decide to wrap the hull. They also decided on a color change, from white to gun-metal gray, this time. The Wild Group also wraps pool linings, interiors, and window foils for privacy and heat control. Monaco yacht charter vessel LAUREN L had foil applied to 120 windows. The project took place in Sardinia. It was completed between Italy yacht charter bookings – amazingly, in just six days. Almost immediately, the crew of M/Y LAUREN L reported the air conditioning system was working more efficiently and interior temperatures were lower. Jana Sheeder, Co-Owner and President of 1-800 Yacht Charters, applauded the owner of motoryacht Lauren L for taking such an eco-friendly move in saving fuel for yacht charter guests by tinting all 120 windows. Of course, catering to superyacht owners sometimes means working on the owner’s “other” boats, no matter the size. Formula 1’s Eddie Jordan loved the color of his Sunseeker 155 yacht BLUSH. Mr. Jordan then wrapped the hull of his very first boat – a small Sunseeker Mohawk 29. The team color-matched the wrap to the same paint scheme on motor yacht BLUSH. They used premium quality Färben brand foils. They also wrapped the superstructure with a white application, including non-slip wraps to the foredeck. Using a unique designer twist, they created a leather effect to the interior to give it a clean, refreshed look. 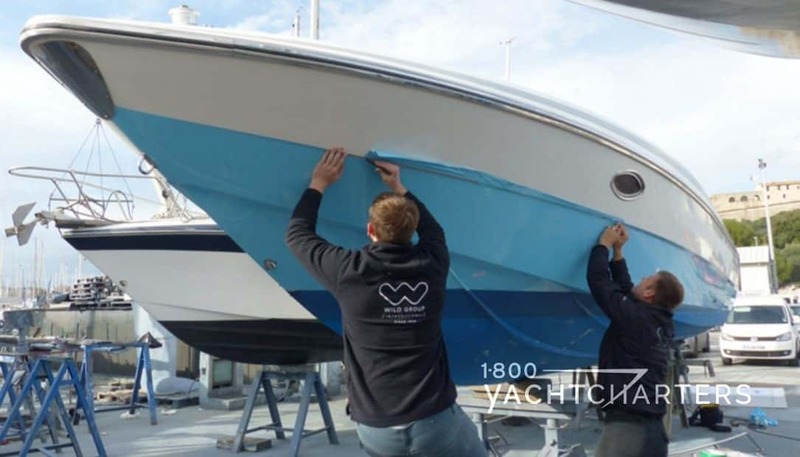 READY TO WRAP YOUR YACHT OR VEHICLE? For more information contact 1-800 Yacht Charters at 1.800.922.4824 (toll free North America) or 1.305.253.7245 (local and international), or click https://www.1800yachtcharters.com/book-now-contact-us/ today.